Plastic link for coil plungers used on many Bally and Williams games. Replaces earlier bakelite link on older EM (electro-mechanical) and early SS (solid-state) games. Used on many devices including ball release mechanism, slingshot kickers, diverters, ramp lift mechanisms, and more. Measures 1 inch overall length, 3/4 inch wide, 3/32 inch thick, with 1/2 inch distance between holes (center to center). 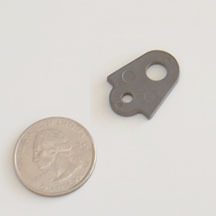 Small hole measures 1/8 inch diameter, large hole is 1/4 inch diameter. Requires roll pin for mounting to plunger (not included).